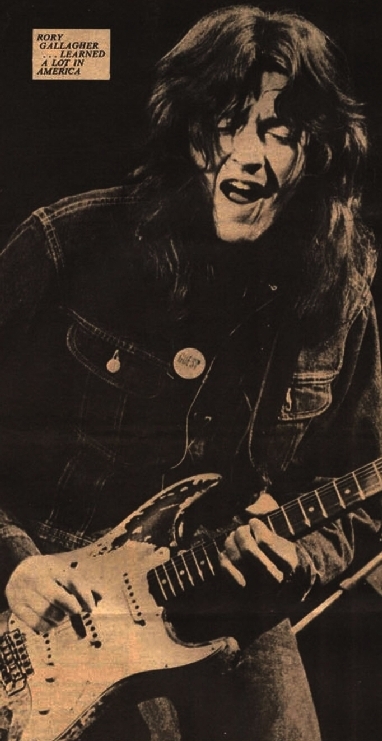 RORY Gallagher has recently completed an amazingly lengthy tour of the States, lasting almost four months, has had only one week’s rest back home in Cork during which he wrote new material and is almost finished recording his new album in London. And now he feels restless because he hasn’t played in front of an audience for almost three weeks. “You can only play to yourself, or the band, or your friends for so long before you need to play in front of a whole audience again,” said Rory. He didn’t look in the slightest bit worn although a similar tour would wipe out most other bands who work in America. He has a calm acceptance of events which makes him a very unusual person, as well as an excellent musician. He has changed very little since the days of Taste, when I used to see him play in a small club in Fife. Practically the whole town used to squeeze in to listen to him and even now he thinks it must be the hottest and sweatiest place ever to perform in. “I’m basically the same musician as I was when I played there, or even if you’d seen me play when I was 11 or 12, there isn’t that much difference. I’ve learned a lot of things since then though. “I learned a lot of things in the States, just by talking to people. That’s why I like doing the small clubs, because people come up to you afterwards and tell you what other musicians live in the town, or who else plays there. Having new musicians must have made some difference to his band, but Rory has made sure he has the right men. Lou Martin on keyboards and Rod de’Ath (drums) both came from Killing Floor and have been with Rory since before the short tour of Italy five months ago. The American tour gave them a good chance to tighten up their music together. Gerry McAvoy has been with Rory a bit longer and has known him since Taste used to play in Ireland. At the moment, it’s only Rory and the band on their new album, although they might use someone else for the later tracks. The album is due out at the end of January, to coincide with a tour of the Continent and a British tour going through until March 7. The British tour will include fairly extensive dates in Scotland because the band are always so well received there, and also because most bands only take in Glasgow and Edinburgh, leaving large areas out. They will be doing dates in Ireland over Christmas. “You do get a bit tired travelling so much, but I think it’s only psychological. Some bands go across with a four week tour planned out, but when extra dates are added on, you begin to feel tired. If you don’t look at it that way, you don’t feel tired. “I saw lots of people across there, like Albert King and Muddy Waters. We just wandered into this club in New York to see what was happening and Muddy Waters was up there with his band. He’s changed slightly, and has Jack Myers on guitar now, but he has the energy of a 16 year-old, although he must be about 55 by now. It’s amazing. His band of the early 50s really shaped modern blues. Rory did a few open-air festival things in between concert and club dates. The biggest was at Bulls Island in Virginia where they played to an audience of 360,000. At another open site in North Carolina there was an audience of 300,000. Following Alice isn’t a job that many bands would be pleased about, but true to form, Rory doesn’t let much worry him. He cares only about his music – I know that sounds corny but it’s true. He has always been like that and is entirely free from the image making that attaches itself to many other bands around. The same lack of hassles apply to his albums. At the moment he is only worried about the one he’s working on, although there have been problems with releases in the past. Early in his career he was signed to Major Minor, and there was a mix up over an album which was due for release then. It was in the shops only a couple of weeks before being withdrawn. Although he is now with Polydor, another company hold some studio tracks and demos. They only make up about 20 minutes of playing time, but there’s always the thought that they might be released. The last album out here was “Live At The Isle Of Wight,” and Rory didn’t hear the tapes for that until the record was on sale. “That side of the business doesn’t interest me. I’m only interested in the music I’m playing at the moment. You can avoid syndromes, if you really want to. I’m not often in the situation for instance where I can only play a 45 minute spot. It’ll be refreshing to listen to him.